Director/Screenplay – Stephen Sommers, Producers – Stephen Sommers & Bob Ducsay, Photography (some scenes b&w) – Allen Daviau, Music – Alan Silvestri, Visual Effects Supervisors – Ben Snow & Scott Squires, Animation Supervisor – Daniel Jeanette, Visual Effects – BUF, CIS Hollywood, Digiscope, Illusion Arts (Supervisors – Syd Dutton & Bill Taylor), Industrial Light and Magic, Pacific Title and Digital, WETA Digital (Supervisor – Joe Letteri) & Zoic Studio, Special Effects Supervisor – Thomas L. Fisher, Makeup Effects Supervisor – Greg Cannom, Makeup Effects – Keith Vanderlaan’s Captive Audience Productions, Production Design – Allan Cameron, Character Design – Gerald Brom, Mark McCreery & Patrick Tatopolous. Production Company – Universal. 1888. Van Helsing is a wanted man all across Europe. In actuality, Van Helsing works as a secret agent of The Vatican, dispatching monsters. He is sent to Transylvania to deal with a threat he has never encountered before – vampires, led by Count Dracula. Teaming up with the Gypsy princess Anna Valerious, Van Helsing combats Dracula and his vampire brides. At the same time, they must also deal with Anna’s brother Velkan who has become a werewolf. They also encounter the Frankenstein monster and discover that Dracula needs it to complete an essential process that will bring his offspring to life. Stephen Sommers is a director who has emerged to the frontline of genre filmmaking in recent years. Stephen Sommers first appeared with the high school drama Catch Me If You Can (1989) – unrelated to the 2002 Steve Spielberg movie of the same name – and then moved to Disney to make The Adventures of Huck Finn (1993). Neither film attracted much attention but Stephen Sommers then stepped onto the genre stage with the Disney live-action remake of The Jungle Book (1994). This still remains Stephen Sommers’ best film with its lavish evocation of a fantasy India and fine sense of period adventure. Stephen Sommers’ next film was Deep Rising (1998), a monster movie that collapsed into laughable ridiculousness with a campy attitude and action that was not credible in the slightest. Sommers then had a major success with The Mummy (1999), which revived the classic Famous Monster with lavish CGI effects and mounted it as an adventure vehicle. However, the effectiveness of the spectacle was considerably undercut by a campily unserious attitude upon Sommers’ part that sank any suspension of disbelief. This was quadrupled by the time of Sommers’ sequel The Mummy Returns (2001), which existed as nothing other than an exercise in bombarding an audience with CGI effects, with everything else in the film – plot, dialogue, actors and even basic credibility – being regarded as subordinate to perpetual Jack-in-the-Box effects. Van Helsing continues the downward spiral. While Stephen Sommers has certainly emerged to the forefront of A-budget genre directors, Van Helsing is also a film that possibly places Stephen Sommers into the league of one of the worst directors in the world, alongside Joel Schumacher of Batman & Robin (1997) notoriety, Renny Harlin and Jan de Bont. Van Helsing is ostensibly Stephen Sommers’ big-budget reworking of a 1940s Famous Monster bash – of films like Frankenstein Meets the Wolf Man (1943), House of Frankenstein (1944), House of Dracula (1945) and Abbott and Costello Meet Frankenstein (1948). The originals came about less out of a creativity ingenuity than a creative desperation, where Universal Studios (also the producers of Van Helsing) threw together their in-house monsters in a tag-team match of sorts in an effort to creatively revive flagging formulas. Although what Van Helsing resembles, less than a big-budget 1940s Universal monster bash, is the recent The League of Extraordinary Gentlemen (2003). 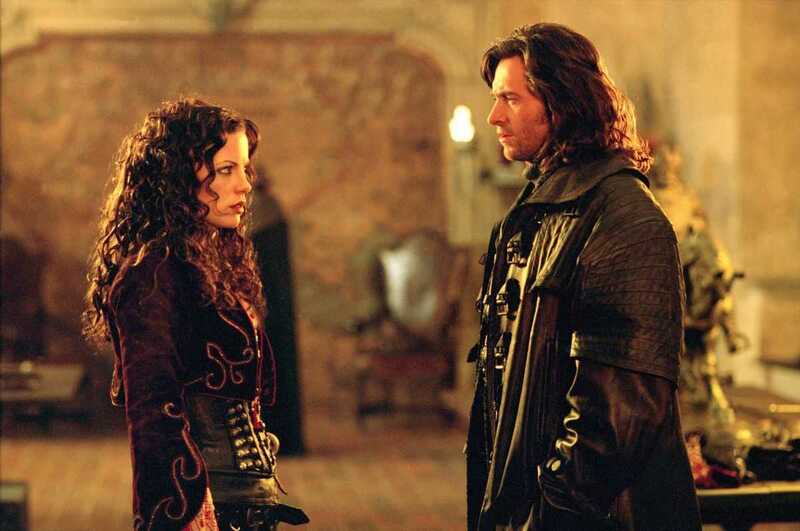 Both Van Helsing and The League of Extraordinary Gentlemen are films that make the pretence that familiar screen and literary characters inhabit a shared world and speculate as to their various meetings up. (There are also a surprising number of direct similarities between Van Helsing and League – both feature Britsh actor Richard Roxburgh; both have a three-times-normal-size Mr Hyde and a scene where he is pursued across Parisian rooftops). Van Helsing, like The League of Extraordinary Gentlemen, is very much a film that plays into the audience’s familiarity with its characters – Viktor Frankenstein appears in a black-and-white prologue, along with Igor, making the famous cry “It’s alive” before perishing in a burning windmill along with his creation, just like in the original Frankenstein (1931); there is an appearance from Dr Jekyll and Mr Hyde in a fight that takes place in Paris’s Notre Dame cathedral (with a partially constructed Eiffel Tower in the background); and later there is a slightly altered appearance of the famous poem “Even a man who is pure in heart and says his prayers by night, may become a wolf when the wolfbane blooms and the autumn moon is bright,” created by Curt Siodmak for the original The Wolf Man (1941). Equally so, Stephen Sommers takes dramatic licence with the characters. Case in point being the title character – in Bram Stoker’s Dracula (1897), Van Helsing was an elderly man of Dutch background who was an expert in Mediaeval lore; Sommers has Van Helsing a wanted criminal who is a secret agent of the Catholic Church, ignorant of vampire lore and is, despite his Dutch name, possibly immortal and at least several thousand years old. One supposes that it might be possible to cast the role of James Bond with Pee-Wee Herman or Pauly Shore, but the question is – if you are going to use the name of a well-known character and play into audiences familiarity with it, then why ditch every single aspect that is associated with the character? Unfortunately, the pleasure that one anticipated in seeing a lavish CGI-redressed modern monster bash quickly collapses under Stephen Sommers overkill. In fact, everything in Van Helsing collapses under Stephen Sommers’ persistent obsession with bombarding his audience with CGI effects. Van Helsing has to be one of the most annoyingly manipulative films one has seen in some time. It operates entirely as a one-dimensional film, one that keeps demanding you goosestep in line with it and feel every dramatic cue that it wants you to with every single thing spelt out in upper case both by Sommers and a loud and unsubtle score in the unlikely event that there might be a single member of the audience who does not understand what is going on. It is a film that has been made with no other intent than holding up a large sign, just like the Applause signs at live-tv tapings, that says “Go Wow now … Feel excited now … Go Wow again.” In fact, it is worse than that – it is a film that stands over you and demands you feel awe and excitement at every single moment and keeps jabbing you in the ribs every time that one’s pulse is in danger of pumping at slightly less than full tilt. Everything in Van Helsing is ridiculously over the top. Nobody does anything as simple as leave by a door, they have to smash through walls or stained-glass windows; no-one merely falls over, they have to collapse through multiple floors and/or end up hanging on the edge of a precipice; there are so many acrobatic backflips and scenes with characters conducting death-defying swings on the end of ropes that one literally lost count; there is no such thing as a mere landscape or building, each one is overdressed to the point that it is an architectural marvel or sweeping panorama that extends to the horizon; Frankenstein’s laboratory doesn’t just spark with electricity, the entire room becomes a live grid pulsing with electricity; there is no such thing as a mere Italian masque – it is one overdressed with hundreds of costumed attendees and jesters and acrobats performing wire stunts three stories above the crowd. 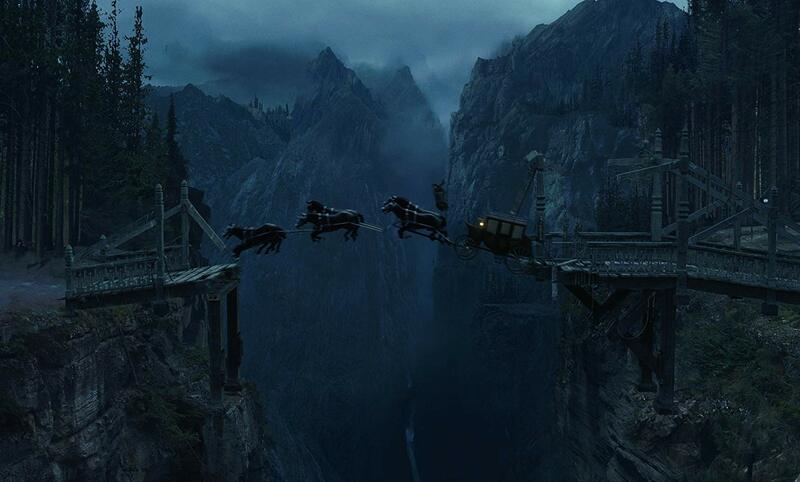 Although surely the most ridiculous scene in an entirely ridiculous and unconvincing film was the scene where a team of six horses harnessed to a carriage manage to conduct a stunt leap across a ravine. Yet contrarily, all the eye candy and the determination to impress you at every opportunity proves so persistently one-note that Van Helsing collapses into a thorough lack of affect. There is not a single moment of genuine seat-edge suspense, a single moment of wonder or a single scare to be found in the film, so little effort does Stephen Sommers spend investing in anything dramatic. Van Helsing is even a film where the actors can be considered almost entirely irrelevant to the CGI effects. Anything that requires actors to emote or convey something by their skills alone has almost entirely been eliminated from the film. Instead of doing anything like leering menacingly, Dracula gives snarls that come amplified by the full underscoring of a THX stereo sound system and walks up walls vertically – take the effects away and all this film’s Dracula is is no more than an actor out of a cheesy B film with a laughably fake European accent. Rather than seduce their prey, all the brides do is cackle campily and then transform into winged harpies with foot-long prehensile jaws. Stripped away of all the CGI effects and the overhyped score, Van Helsing is a film that has all the depth of plot of a kid’s cartoon. Actually no, that’s insulting to kid’s cartoons, which can often be quite intelligent. In his scripts, Stephen Sommers has an irritating ability to throw in shameless cliché plot devices and wave of the hand deus ex machina that are absurdly contrived. Here David Wenham accidentally trigger a secret door that just happens to then display an animated painting that gives the secret of how to defeat Dracula, while the same library also holds a map that turns into a convenient portal that leads directly to Dracula’s castle and Van Helsing just happens to have been mysteriously left a scrap of parchment that proves the key to opening the doorway (left by whom Sommers never deigns to tell us). Dracula’s evil plot has little rhyme or reason – something about him needing to find a means to bring his offspring to life. This has been given convenient twists – he needs werewolf serum in his initial experiments, while Frankenstein has for some bizarre reason left the process only able to be completed by using the monster as a conduit during the standard laboratory resurrection sequence. With equal arbitrariness of plotting, Van Helsing is transformed into a werewolf and the plot reveals that Dracula can only be killed by a werewolf, while Sommers also dictates that Dracula also be the only one who has a serum that can transform Van Helsing back. 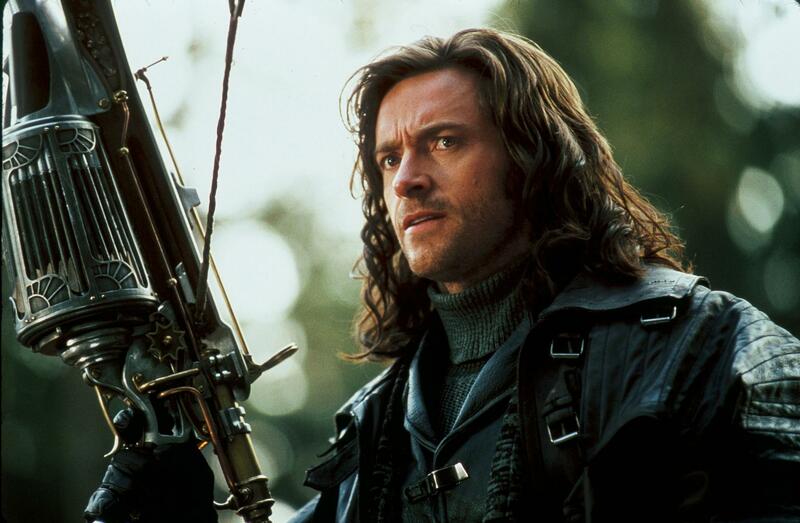 Hugh Jackman made a strong attention-grabbing appearance on the international stage with X-Men (2000), but in the next few years immediately after his choice of films – Swordfish (2001) and Someone Like You (2001) – has been uneven to say the least. Here his natural talent is almost entirely swamped by the rest of the film. Van Helsing, at least the way the Stephen Sommers would have it, should have come out something like Wesley Snipes in Blade (1998) – all grim, focused intent and single-minded purpose, whereas Hugh Jackman fails to make any distinction in the role whatsoever. Even his physique seems submerged by the film’s surroundings, with he looking diminutive as a hero, whereas the role as it is written requires someone with near-superhuman physical type or at least heroic charisma. Opposite Hugh Jackman, Kate Beckinsale essentially does a repeat of the role she did in Underworld (2003), although the way the character is played and dressed, one cannot in the slightest believe her as a credible woman of the time period. Richard Roxburgh, with powerfully booming voice, is certainly one of the actors on the rise worth noting – he made an excellent Sherlock Holmes in the tv remake of The Hound of the Baskervilles (2002) – but is an entirely cardboard Dracula. Among the cast, it is only Australian actor David Wenham who makes any impression, proving an occasional scene-stealer with his dry delivery. Van Helsing (2016– ) was a subsequent tv series featuring Kelly Overton as Van Helsing’s granddaughter, although is unrelated to this film. Stephen Sommers next moved onto make G.I. Joe: The Rise of the Cobra (2009) and the Dean R. Koontz adaptation Odd Thomas (2013). Sommers has also produced The Scorpion King (2002), The Mummy: Tomb of the Dragon Emperor (2008), The Scorpion King: Rise of a Warrior (2008), The Scorpion King 3: Battle for Redemption (2012), G.I. Joe: Retaliation (2013), The Scorpion King 4: Quest for Power/The Scorpion King: The Lost Throne (2015) and Scorpion King: Book of Souls (2018). (Winner Worst Film in this site’s Worst Films of 2004 list. Nominee for Best Special Effects at this site’s Best of 2004 Awards. No. 9 on the SF, Horror & Fantasy Box-Office Top 10 of 2004 list).